The EX001 is the best bus from Colombo to Galle, travelling between the Colombo Maharagama Bus Station and Galle Central Bus Station, as it travels along the Southern Expressway. Busses run from 5am every 20 minutes daily with the last bus leaving Galle for Colombo at 20:40pm. Tickets can be bought from the conductor on the bus, so no need to purchase in advance. is there a highway bus from Galle to Isurupaya in the morning? Is there usually space on the express bus from Colombo to Galle? Will we stand and wait for a long time to get a bud in December or is it not so bad? There are plenty of busses so it’s usually pretty quick to get on and go. Plus they don’t let you stand on the express bus since it travels on the highway. Airport to Galle. Now I am sitting on this bus to Galle. First I ordered Uber from airport to Maharagama Rd bus stop which costs 2,025 + 300 for toll. Then I caught the 8pm Ex001 to Galle for 450. Today is Sunday 2nd December 2018. Hope this helps. Is there any buses before 5 a.m to galle? Hi , I want to go from Kalutara (probably dodangoda) to Malabe . How would I do this ? How much is a two-way ticket if such a thing is available? And is there any per-month basis ticket so that I will have to buy a ticket only once for the whole month? I’ve never bought a return ticket as such, let alone a season ticket! Please let us know what you find out! Does this bus stop at Megalle bus stop on the way from Galle to Colombo? If it does not, can I stop it there? What does it look like (is there a board with EX001 on the front)? The express busses don’t tend to stop, certainly not on the highway. Once you’re off the highway you can ask them to stop at a particular junction, for example. Yes, they have a number board, but it’s best to check with the driver that it’s going where you’re going! Hi, what time is the last bus leaving FROM Maharagama to Galle today (Saturday the 28th)? Thank you! Last bus is around 9 I think, but go earlier to be sure! How can to get to Galle from Colombo Airport? Hi, I will be staying in Unawatuna in November, My flight back to the UK is 13.05 pm on a Sunday. Will I be able to get a very early bus or train up to Colombo giving enough time to make my flight, I don’t really want to check out of my hotel the day before & stay Saturday night in Colombo. Are there less buses/trains running on a Sunday? If I could depart around 5am/6am it would be great. Hi are the buses running as normal over vesak? Hi are the buses running on April 13th and April 14th? We want to take the highway bus from Maharagama to Galle and then Galle to Maharagama on the next day. Hello, is there an express bus from Negombo to Unawatuna? If there is, where do I get it from and what times do the buses leave from Negombo? Also, can I get an express bus from Unawatuna to Negombo? If I can, where do I get the bus from and what are the times? Thanks! Best way to get from untawatuna to Negombo.? Am I right in saying the ex001 from Galle to Colombo then another bus/taxi to Negombo. Could you please tell me any times for the ex001 from Galle to Colombo. Thanks. Yeah, the express bus to Colombo is the way to go. You can then get a tuk/taxi/uber to the fort bus station and another bus from there, or all the way to Negombo… if you’re heading to the airport there’s also an express bus from Colombo Fort to the airport. Is it possible to catch an expressway bus to Galle and Matara from Fort Central Bus Station or Bastian Mawatha, or do services only start from Maharagama? You can, but we reccomend getting a tuk to Maharagama and jumping on the express bus from there. I am staying in Dehiwala. Can I ride the EX001 to Galle from the highway near here or do I need to go north to Colombo first? If I can ride from here, where should I go to get on the bus? Thank you! Hi, I need to get from Colombo to Galle with large luggage, I have read the drivers do not like luggage. Is it possible to pay extra for the space my luggage will use. The highway bus from maharagama has space in the hold, like a modern coach… you can fit a surfboard in there for example. I stay in Dehiwala and wanted to go mirissa. Is there any direct bus. I want to go from Airport to Galle. I Arrive at 16:10 at the airport on 2.9 (Saturday). At which time starts the last bus to galle? There is a bus that goes from Negumbo all the way down south using the Highway, number EX01. However it doesn’t come to the airport, it comes down the main Negumbo road, so you’d have to take a tuk or a taxi to the road to catch it. There are two per day, one leaving at 7am and one at 3pm. You can call 1955 for more bus information. i want to get this highway bus from katunayaka air port to galle.is it possible ? Q1 .How long it will take to reach Galle from Colombo via AC bus (Both Express way and Normal Route? Can I know if the express way bus service is operates on the 14th April as this is the New Year. Im referring to the bus from Maharagama to Matara. Hey Hansan, have you found out more about this? We need to get from Galle to Colombo tomorrow (new years day) and we hope we can get an express bus. Can I know the exact leaving time of the 1st bus in the morning from Maharagama end? i want to get this highway bus from hikkaduwa to maharagama.is it possible ? Hi, We don’t think so. But you can get the highway bus to Galle and then take a bus or tuk back to Hikkaduwa. Does the highway bus from Matara to Maharagama charge for an extra bag put underneath the bus? I was just asked for 100 rupees for an extra bag to go underneath. I have been getting the highway buses to Galle and Matara since the highway opened and I’ve never been asked for a charge and he couldn’t give me a receipt for this charge so I am suspicious! Does the highway bus from Matara to Maharagama charge for an extra bag put underneath the bus? I was just asked for 100 rupees for an extra bag to go underneath. I have been getting the highway buses to Galle and Matara since the highway opened and Gav’s never been asked for a charge and he couldn’t give me a receipt for this charge so I am suspicious! I am staying in Peradeniya and my friends here tell me there is a direct express bus (highway) from Kandy to Matara (and vice versa), but I haven’t found any information on the internet. Does anyone know if it exists and if there is a timetable available? To stay in Colombo is not an option as we have to be in Hambantota next morning for a friends wedding. At that time I think your best bet would be to spend the night in Colombo and head to Hambantota the following morning. You can get an express bus into the centre of Colombo (or take a taxi…). Then I think you’ll find an express bus at least as far as Matara from Fort, if not all the way to Hambantota. Let us know how you get on! Hello, when is the last bus in direction from Maharagama to Galle? Hello! Im going from Dehiwela to Indiruwa, please tell me which bus should I take. For that journey you can easily take one of the AC busses that race along Galle Road. The No. 32 bus also does the journey. I’ve read 99% of the comments here regarding the 101 Express bus from Colombo Maharagama Bus stop to Galle. Question 1: Is Maharagama Bus stop; the same as Kadawatha Expressway bus stop? Question 2: Airport Express bus, does this take me to Colombo Maharagama? Or would it be better to take a taxi from the airport the Colombo Maharagama / Kadawatha Expressway bus stop? We will be arriving in 2 weeks! Q1 – no. The expressway has been extended as far a Kadawatha, but Maharagama is in Colombo. Q2 – No. the Airport express goes to the Fort bus station in the centre of Colombo. However, it is possible to get an express bus from fort. If you have a look at our ticket booking partners website busbooking.lk you’ll be able to get tickets. We haven’t got around to adding those routes yet. You could get a taxi direct to Maharagama, or even to one of the other highway stops, such as Kadawatha or even Kaduwela – but check on the availability of busses from those first. We’ll be adding more highway busses soon. I am looking for an express bus from Colombo/Maharagama to Matara. I saw a bus named EX1-1 but I did not find it on your website. Do you have more information? If it is a wrong information, would you have any advice for an express bus to go to Matara? Just followed that advise and I regret it. It might be a good option indeed BUT there were 200 people queuing to take that bus. Only Locals. So the moment you reach that place (45 min by cab from Fort) and the moment you eventually get on a bus, it can last as long as 3h, queuing in a very noisy, busy and pollution area. So one piece of advice, don’t take a bus from Maharagama unless you have some time to loose and nerves too. hey, could you tell me when is the first bus from GALLE to KADAWATHA? Are there buses going from Galle fort to Colombo, today on 1st May? Hi There, what time does this bus go from Galle- Colombo and where in Galle is the bus stop? Any bus to Galle from Bandaranayaka Int’ Airport? How to use highway bus? Galle to Maharagama on the EX001 bus on the highway. Then take a taxi (you can get deals for around Rs1600, but normal taxi fair is around Rs3,000 including the highway). Or you can get a taxi or tuk from Maharagama to Fort and then get the Airport Express bus to the airport. One other route would be to find an express bus to the END of the highway, and then book a taxi from there… but I think it will be as expensive. Hi, does this bus run from Galle TO Colombo leaving at 5am on this Friday the 22nd Jan? Or does it only run from Colombo to Galle? Am I right that this bus goes from Galle to Colombo by the same schedule as from Colombo to Galle? And the second question: is any bus from Maharagama to Negombo? Yes, Galle to Colombo is the same schedule. How to go Galle from the Airport by public buses on highways…??? No, the highway currently only reaches as far as Matara. You could take the highway bus that far and then take another bus from there. Yes. There are buses to Kataragama, Akuressa, Hakmana, Deniyaya, Kamburugamuwa, Embilipitiya, Weeraketiya via southern expressway. Please visit http://www.BusBooking.lk if you need to reserve those online. 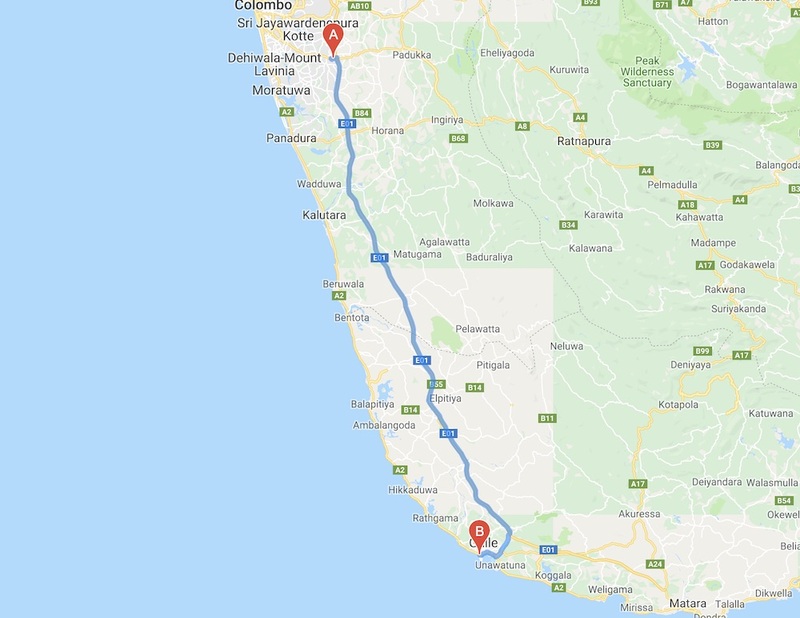 Another option is to take the express buss (EX001) on the highway to Galle and a local buss from Galle to Hikkaduwa, this might be faster than the buss on Galle Road (along the coast). Hi, I’m interested in this route, but I don’t know how to get Maharagama from the Internation Airport. Thanks!!! There is also an Airport Express bus, the 187 E, that will take you to the Fort bus station in Colombo. From there you can either take a tuk-tuk (which will cost around Rs800/- if you use a meter tuk) or you can take a number of busses, including the 113 and the 138. There are a number of Taxi options, including UBER here in SL. I saw that SONIT TAXI’s are offering Rs1600 Airport Pickup, which is pretty good value. Their number is +94 117 589 589 or http://www.sonit.lk/ (no affiliation with us…) You can use our other app faresfair.co to calculate the cost of the journey (see the link above). It’s a long way for a Tuk Tuk, and Tuks can’t use the Highway, which I highly recommend for comfort and speed! do you have night bus going to Hikkaduwa beach !? You should be able to get a bus heading south from the fort bus station or hail one down along the Galle Road, such as the No.32. If you’re coming from the airport you can get the airport express bus to the Fort bus station and then get another bus from there. Where the bus station,time,how long to go ? The bus station is in Maharagama, it takes about an hour to get to Galle, and the busses leave every 30 mins or less. Hi Is this bus go through the highway road?